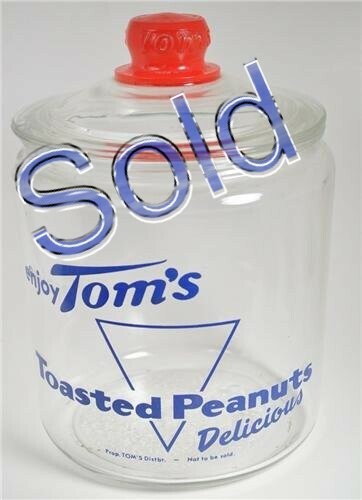 This vintage Large Tom's Peanut Cannister Jar is in Great Condition. Only flaw at all is around the inside rim of wear and slight flaking from the lid being taken on and off many times. The color on the red lid and the lettering are great and quite vivid. This is in Amazing Condition for it's Antique age! A Great Tom's Peanut Nostalgic Find Here! IMPORTANT SHIPPING NOTE: This Peanut Jar will ship USPS Parcel Post with Delivery Confirmation for your tracking convenience. Our goal is Integrity, Honesty, and a Fair Price with nothing less than total satisfaction for your purchases!